OpenNebula 2.0 RC1, ready for testing! Today, the OpenNebula team has released a candidate (RC) of what is to become OpenNebula 2.0. This means that the team is now officially in bug fixing mode, and the repository has been set to feature freeze. Please also note that OpenNebula 2.0 RC 1 is targeted at testers and is not recommended for production environments. With respect to the previous Beta Release (1.9.80), OpenNebula 2.0 RC1 solves most of the bugs identified during the testing phase and features a new set of decoupled actions from the drivers. This means that with OpenNebula 2.0 it is even easier to tune the operations performed upon specific actions (e.g. shutdown, create, cancel). Also this reduces the number of connections to the cluster nodes so you should also experiment performance improvements in some areas. We really appreciate the work of the community testing the previous release and giving feedback about issues and bugs. Thank you for helping making a better OpenNebula 2.0! https://opennebula.org/wp-content/uploads/2018/11/opennebula_cloud_logo_white_bg-4.png 0 0 Ruben S. Montero https://opennebula.org/wp-content/uploads/2018/11/opennebula_cloud_logo_white_bg-4.png Ruben S. Montero2010-09-24 12:30:242010-09-24 15:43:23OpenNebula 2.0 RC1, ready for testing! The BonFIRE project brings together a consortium of world leading industrial and academic organisations in cloud computing to deliver a robust, reliable and sustainable facility for large scale experimentally-driven cloud research. Multinational companies (ATOS, HP, SAP), renowned universities and super computing centres (DSA-Research@UCM, EPCC, HLRS Stuttgart, IBBT, TUB), research centres (IT Innovation, FhG Fokus, INRIA, i2CAT) and technology analysts (451 Group) provide the complimentary expertise and infrastructure resources necessary to accelerate the research and development within the Internet of Services community. OpenNebula will provide the EU FP7 project with a powerful technoloy to build IaaS clouds supporting the cloud management functionality, the integration capabilities and the scalability and reliability to run large-scale experiments for future internet research. This news consolidates OpenNebula’s position at the cutting edge of cloud computing technology worldwide, following two recent announcements of its participation in the EU’s StratusLab project, aimed at bringing cloud and virtualization to grid computing, and its participation in the EU’s 4CaaSt project, aimed at building the PaaS cloud of the future. OpenNebula is the leading and most advanced framework for cloud computing, with excellent performance and scalability to manage tens of thousands of VMs. OpenNebula is the result of many years of research and development in efficient and scalable management of virtual machines on large-scale distributed infrastructures. Its innovative features have been developed to address the requirements of business use cases from leading companies in the context of flagship European projects in cloud computing. OpenNebula is being used as an open platform for innovation in several international projects to research the challenges that arise in cloud management, and also as production-ready tool in both academia and industry to manage clouds. C12G Labs has just announced new Support Services Programs to entry into private cloud computing for organizations that want, firstly, to evaluate the suitability and performance of OpenNebula Enterprise Edition in their environments and, secondly, to have a production-ready cloud up and running quickly and with a minimal upfront investment. More details at C12G’s Blog. C12G is the primary private sponsor for the OpenNebula open-source Project, providing a variety of resources, including development, maintenance and infrastructure. Because two data centers are not the same, building a cloud computing infrastructure requires the integration and orchestration of the underlying existing IT systems, services and processes. OpenNebula enables interoperability and portability, recognizing that our users have data-centers composed of different hardware and software components for security, virtualization, storage, and networking. Its open, architecture, interfaces and components provide the flexibility and extensibility that many enterprise IT shops need for internal cloud adoption. You only have to chose the right design and configuration in your Cloud architecture depending on your existing IT architecture and the execution requirements of your service workload. 4CaaSt is a 15-million-Euro EU-funded initiative (EU grant agreement 258862) funded by the 7th FWP (Seventh Framework Programme) under the Internet of Services, Software & virtualisation (ICT-2009.1.2) area, aimed at creating an advanced PaaS Cloud platform which supports the optimized and elastic hosting of Internet-scale multi-tier applications. 4CaaSt embeds all the necessary features, easing programming of rich applications and enabling the creation of a true business ecosystem where applications coming from different providers can be tailored to different users, mashed up and traded together. The 4CaaSt project brings together a consortium of Europe’s leading experts in cloud computing, including UPM, 2nd Quadrant Limited, BonitaSoft, Bull SAS, Telefónica Investigación y Desarrollo, Ericsson GMBH, FlexiScale, France Telecom, Universitat St Gallen, ICCS/NTUA, Nokia Siemens Networks, SAP AG, Telecom Italia, UCM (DSA-Research), Universitaet Stuutgart, UvT-EISS, and ZIB. OpenNebula will provide the EU FP7 project with a powerful technoloy to build IaaS clouds supporting automatic scaling of resources to run the business use-case scenarios in real world conditions. This news consolidates OpenNebula’s position at the cutting edge of cloud computing technology worldwide, following an announcement two months ago of its adoption in the EU’s StratusLab project, aimed at bringing cloud and virtualization to grid computing. OpenNebula 2.0 Beta1 out for testing! The OpenNebula team has released the first beta version of what is to become OpenNebula 2.0 next September. OpenNebula 2.0 Beta 1 is targeted at testers and users that would like to peep at what’s coming to their clouds!. OpenNebula 2.0 beta includes a significant amount of changes and new features in many areas, bringing the most flexible, scalable and feature rich Cloud Toolkit to the Free Software community. OpenNebula 2.0 is the result of a close collaboration with our user community to address their scalability, flexibility and security requirements in large-scale production systems. This new release will break compatibility with OpenNebula 1.4 (at DB and API levels), therefore we’ve decided to follow a larger release cycle to make a smooth transition period, and also to stabilize API‘s and internal data models for the new components. Virtual Networking Improvements. OpenNebula 2.0 lets you define generic attributes associated to a a Virtual Network (e.g. gateway, dns servers…) that can then be included in the context of a VM. This will let you easily configure VMs with multiple NICs. Additionally Virtual Networks can now be defined as public, and thus shared among multiple users. https://opennebula.org/wp-content/uploads/2018/11/opennebula_cloud_logo_white_bg-4.png 0 0 Ruben S. Montero https://opennebula.org/wp-content/uploads/2018/11/opennebula_cloud_logo_white_bg-4.png Ruben S. Montero2010-07-28 11:57:422010-07-28 12:00:53OpenNebula 2.0 Beta1 out for testing! The D-Grid Resource Center Ruhr (DGRZR) was established in 2008 at Dortmund University of Technology as part of the German Grid initiative D-Grid. In contrast to other resources, DGRZR used virtualization technologies from the start and still runs all Grid middleware, batch system and management services in virtual machines. In 2010, DGRZR was extended by the installation of OpenNebula as its Compute Cloud middleware to manage our virtual machines as a private cloud. At present, the resource center is not only a production site of D-Grid, but also of NGI-DE (National Grid Initiative-Deutschland). Additionally it will be used as prototype for the integration of an EC2-compatible Compute Cloud middleware as a new pillar in the D-Grid software stack. After successful integration, DGRZR will act as public cloud resource and allow D-Grid members to deploy their virtual appliances. DGRZR consists of 256 HP blade servers with eight CPU cores (2048 cores in total) and 16 Gigabyte RAM each. The disk space per server is about 150 Gigabytes. 50% of this space is reserved for virtual machine images. The operating system on the physical servers is SUSE Enterprise Linux (SLES) 10 Service Pack 3 and will be changed to SLES 11 in the near future. We provide our D-Grid users with roughly 100 terabytes of central storage, mainly for home directories, experiment software and for the dCache Grid Storage Element. In 2009, the mass storage was upgraded by adding 25 terabyte of HP Scalable File Share 3.1 (a Lustre-like file system) and is currently migrated to version 3.2. 250 of the 256 blade servers will typically be running virtual worker nodes. The remaining servers run virtual machines for the Grid middleware services (gLite, Globus Toolkit and UNICORE), the batch system server, and other management services. The network configuration of the resource center is static and assumes a fixed mapping from the MAC of the virtual machine to its public IP address. For each available node type (worker nodes, Grid middleware services and management services) a separate virtual LAN exists and DNS names for the possible leases have been setup in advance in the central DNS servers of the university. The repository consists of images for the worker nodes based on Scientific Linux 4.8 and 5.4, UNICORE and also Globus Toolkit services. We will soon be working on creating of images for the gLite services. The master images that are cloned to the physical servers are located on a NFS server and are kept up to date manually. The initial creation of such images (including installation and configuration of Grid services) is currently done manually, but will be replaced in near future by automated workflows. The distribution of those images to the physical servers happens on demand and uses the OpenNebula SSH transfer mechanism. Currently we have no need for pre-staging virtual machine images to the physical servers, but we may add this using scp-wave. The migration of virtual machines has been tested in conjunction with SFS 3.1, but production usage has been postponed until the completion of the file system upgrade. The version currently used is an OpenNebula 1.4 GIT snapshot from March 2010. Due to some problems of SLES10 with Xen (e. g. “tap:aio” not really working) modifications to the snapshot were made. In addition to this, we setup the OpenNebula Management Console and use it as a graphical user interface. The SQLite3 database back-end performs well for the limited number of virtual machines we are running, but with the upgrade to OpenNebula 1.6 we will migrate to a MySQL back-end to prepare for an extension of our cloud to other clusters. Using Haizea as lease manager seems out of scope at the moment. With the upcoming integration of this resource as D-Grid IaaS resource, scheduler features like advanced reservations are mandatory. The first edition of the OpenNebula Technology Days, kindly hosted by C12G Labs, took place this week in Madrid. 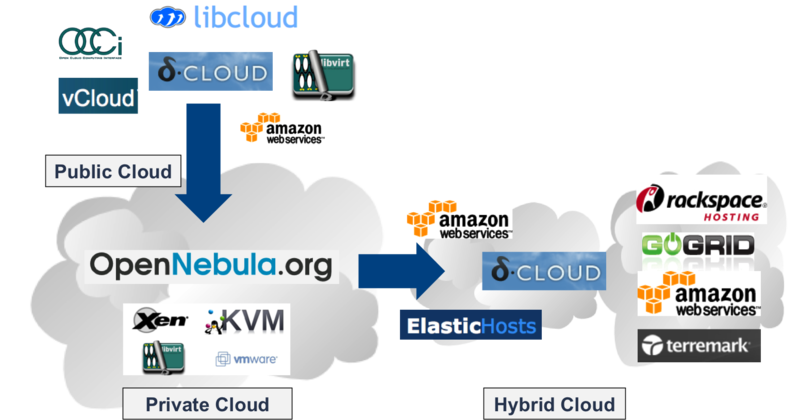 It featured an extensive tutorial on how to install, configure and use OpenNebula to build Private, Hybrid and Public clouds. It included a last session covering advanced topics such as how to extend OpenNebula easily due to its flexible architecture, isolating your virtual networks using ebtables, etc. The event was attended by several partners that actively use OpenNebula as their core toolkit to build clouds. Attendees included people from the following organizations: ATOS, Stuttgart University, IBBT, I2CAT, CNRS, TCD, GRNET, SIXSQ, Telefonica I+D, SURFNET, ESA, Franunhofer FOKUS, NICE, EPCC and IT Innovation. All in all, it turned out to be a successful and very formative event. More information on the agenda and links to the slides used in the OpenNebula Technology Days can be found here. As many of you know, a new open-source cloud platform, OpenStack, was recently announced. Here at OpenNebula, we think this is a very exciting development in the cloud community, and we’re glad to see so many major players coalescing around an open-source solution. However, we have also been concerned by the all the high-profile announcements and opinion pieces that describe OpenStack as the first initiative for the definition of an open architecture for IaaS cloud computing and a “real” open-source project, criticizing some existing open-source cloud projects as being “open-core” closed initiatives (in some cases conflating “open-core” with “having an Enterprise edition”), and pointing out their lack of extensibility and inability to efficiently scale to manage tens of thousand of VMs. This is the reason why we have decided to write this post in order to clearly state our position in order to avoid misunderstandings, particularly with our growing community of users. OpenNebula was first established as a research project back in 2005, with first public release in March 2008. We have a strong commitment with open-source, being one of the few cloud management tools that are available under Apache license. The Apache license allows any Cloud and virtualization player to innovate using the technology without the obligation to contribute those innovations back to the open source community (although we encourage that this work be contributed back to the community). This is the case for many third-party commercial products that embed OpenNebula. C12G Labs is a new start-up that has been created to provide the professional integration, certification and technical support that many enterprise IT shops require for internal adoption and to allow the OpenNebula project to not be tied exclusively to public financing (research grants, etc. ), contributing to its long-term sustainability. Although C12G Labs does provide an Enterprise edition of OpenNebula, all software extensions and patches created by C12G (distributed in the Enterprise Edition of OpenNebula to support customers and partners) are fully contributed back to OpenNebula and its ecosystem under an OSI-compliant license. So OpenNebula is NOT a feature or performance limited edition of the Enterprise version. C12G Labs contributes to the sustainability of the community edition and is committed to enlarge the OpenNebula community. C12G Labs dedicates an amount of its own engineering resources to support and develop OpenNebula and so to maintain OpenNebula’s position as the leading and most advanced open-source technology to build cloud infrastructures. The OpenNebula technology has matured thanks to an active and engaged community of users and developers. OpenNebula development is driven by our community in order to support the most demanded features and by international research projects funding OpenNebula in order to address the demanding requirements of several business and scientific use cases for Cloud Computing. We have also created the OpenNebula ecosystem where related tools, extensions and plug-ins are available from and for the community. OpenNebula is an open-source project aimed at developing a production-ready cloud management tool for building any type of Cloud deployment, either in scientific or in business environments. OpenNebula releases are tested to assess its scalability and robustness in large scale VM deployments, and under stress conditions. Of course, you don’t have to take our word for it: several users have reported excellent performance results to manage tens of thousands of VMs. We have been encouraging some of these users to write on our blog about their experiences with OpenNebula. So far, you can read this recent blog post on how OpenNebula is being used at CERN, with more user experiences blog posts to follow soon. Because two datacenters are not the same, OpenNebula offers a open, flexible and extensible architecture, interfaces and components that fit into any existing data center; and enable its integration with any product and service in the Cloud and virtualization ecosystem, and management tool in the datacenter. OpenNebula is a framework, you can replace and adapt any component to efficiently work in any environment. OpenNebula is the result of many years of research and the interaction with some of the major players in the Cloud arena. This technology has been designed to address the requirements of business use cases from leading companies in the context of flagship international projects in cloud computing. The main international project funding OpenNebula is RESERVOIR. OpenNebula is an implementation of the IaaS management layer of the RESERVOIR open architecture defined by its partners: IBM, Telefonica Investigacion y Desarrollo, University College of London, Umeå University, SAP AG, Thales Services SAS, Sun Microsystems Germany, ElsagDatamat S.p.A, Universidad Complutense de Madrid, CETIC, Universita Della Svizzera italiana, Universita degli Studio di Messina, and the European Chapter of the Open Grid Forum. The outcome of this collaboration is the unique functionality provided by OpenNebula. OpenNebula is used, together with other software components, in new international innovative projects in Cloud Computing. StratusLab with the participation of Centre National de la Recherche Scientifique, Universidad Complutense de Madrid, Greek Research and Technology Network S.A., SixSq Sárl, Telefonica Investigacion y Desarrollo and Trinity College Dublin, aimed at bringing cloud and virtualization to grid computing infrastructures. BonFIRE with the participation of Atos Origin, University of Edinburgh, SAP AG, Universitaet Stuttgart, FRAUNHOFER, Interdisciplinary Institute for Broadband Technology, Universidad Complutense de Madrid, Fundacio Privada I2CAT, Hewlett-Packard Limited, The 451 Group Limited, Technische Universitaet Berlin, IT-Innovation, and Institut National de Recherche en Informatique et en Automatique, aimed at designing, building and operating a multi-site cloud-based facility to support research across applications, services and systems targeting services research community on Future Internet;. And many others, such as 4CaaSt with the participation of UPM, 2nd Quadrant Limited, BonitaSoft, Bull SAS, Telefónica Investigación y Desarrollo, Ericsson GMBH, FlexiScale, France Telecom, Universitat St Gallen, ICCS/NTUA, Nokia Siemens Networks, SAP AG, Telecom Italia, UCM, Universitaet Stuutgart, UvT-EISS, and ZIB, aimed at creating an advanced PaaS Cloud platform which supports the optimized and elastic hosting of Internet-scale multi-tier applications. All that said, we’d like to reiterate that we strongly support initiatives like OpenStack. This open source initiative is fully aligned with our vision on what the cloud ecosystem should look like, and we will be happy to contribute to OpenStack with our significant track record in open source and scalable cloud computing management, and with an implementation of the open APIs that will be defined in the context of the OpenStack architecture. However, we felt that some of the buzz surrounding OpenStack unfairly characterized existing open source efforts, and felt it was necessary to reiterate our commitment to an open source cloud ecosystem. Disclaimer: The above represent our position, and may not reflect the positions of any of the projects and organizations referenced in the post. The first edition of the OpenNebula Technology Days will take place in C12G Labs Headquarters in Madrid on the 20th and 21th of July. This first community event includes a tutorial on building clouds with OpenNebula and a technical workshop to present the new features and integration capabilities in the upcoming version. Attendance to the event is by invitation only. A representation of advanced users of the technology, featured projects in the community and C12G partners have been invited, trying to limit the number of participants to 25 in order to ensure an effective event. Due to the very high demand, new similar events will be organized in the next months. Please send us an email to events@opennebula.org if you want to participate.